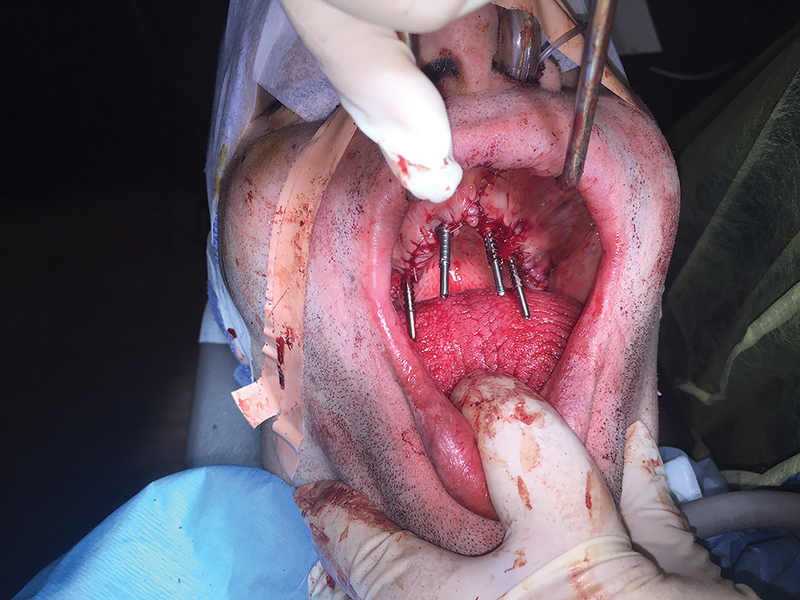 Day of surgery - The all -on-4 implants have been placed and an immediate denture should be readily available. 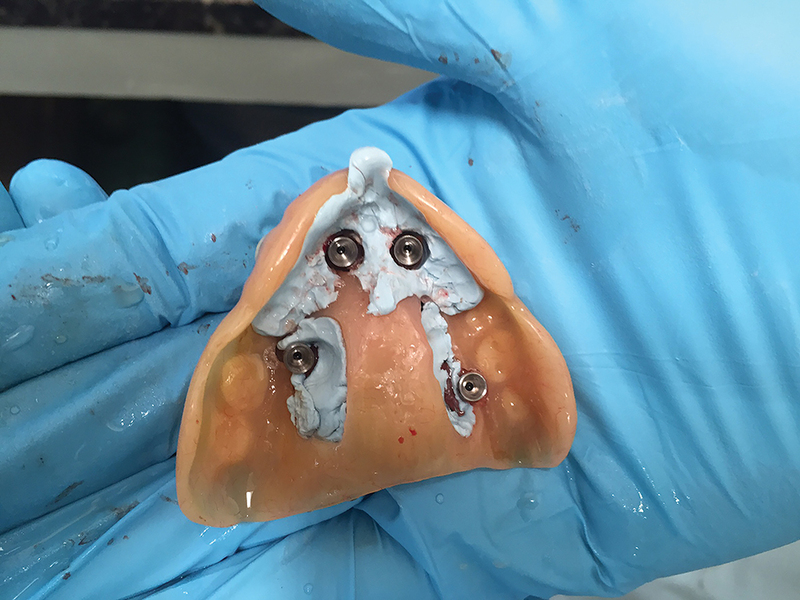 The dentist and the lab tech will work together in the retrofitting of the immediate denture to the implants utilizing temporary titanium abutments and screws. 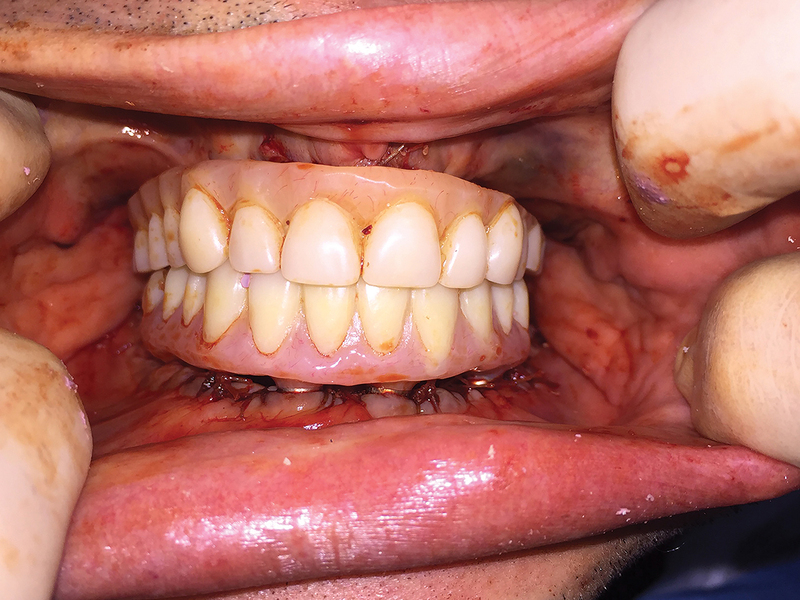 The patient leaves with a temporary screw retained denture. Visit #1 - Initial impression taken for use in fabricating a custom tray. 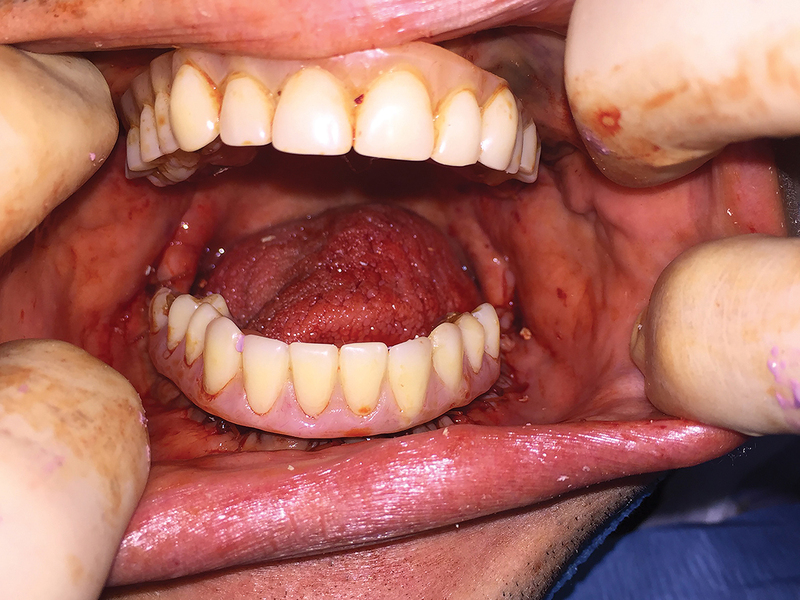 If a custom tray is not needed, the impression is taken using open tray impression copings and sent to the lab for bite blocks to be made. Visit #2 - Bite blocks are sent along with a Verification index. 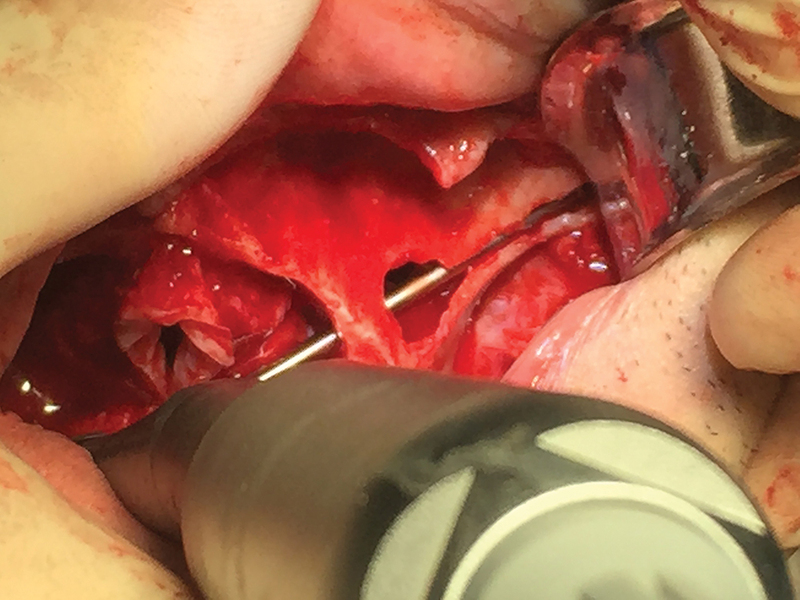 This index will be used to verify that the initial impression is correct and is generally made utilizing temporary UCLA abutments and a temporary material. If you find that the index does not fit, simply section where the discrepancy is and re-lute the sectioned piece with duralay material or temporary material of your choice. Use a rigid material (duralay) that will not flex or bend. The verification index is the only way a lab can guarantee the fit of the bar to be made. Without this there is no guarantee. Set the verification index aside and place the bite bocks in the mouth. 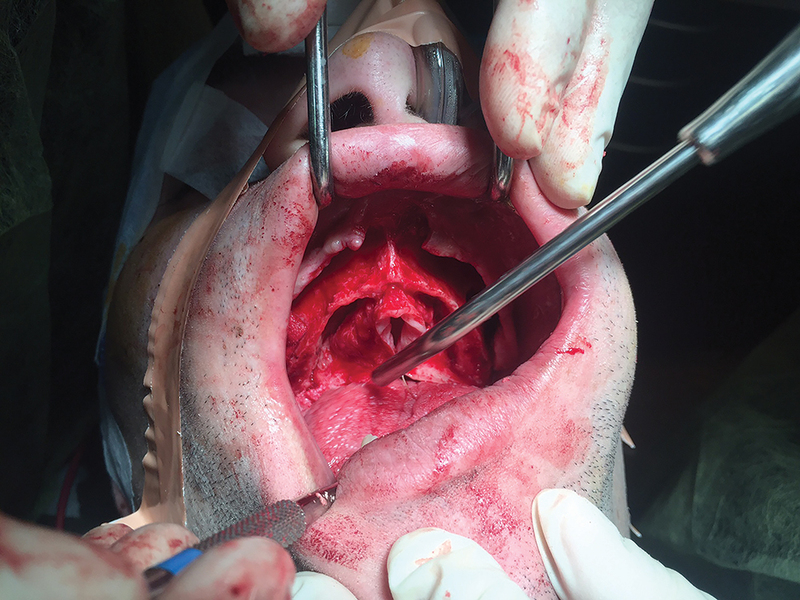 Mark the patients’ midline, lip line and record the bite. Send the bite records and the verification index back to the lab along with the desired shade to be used. Visit #3 - This visit will allow the patient to view what the restoration will look like upon completion. 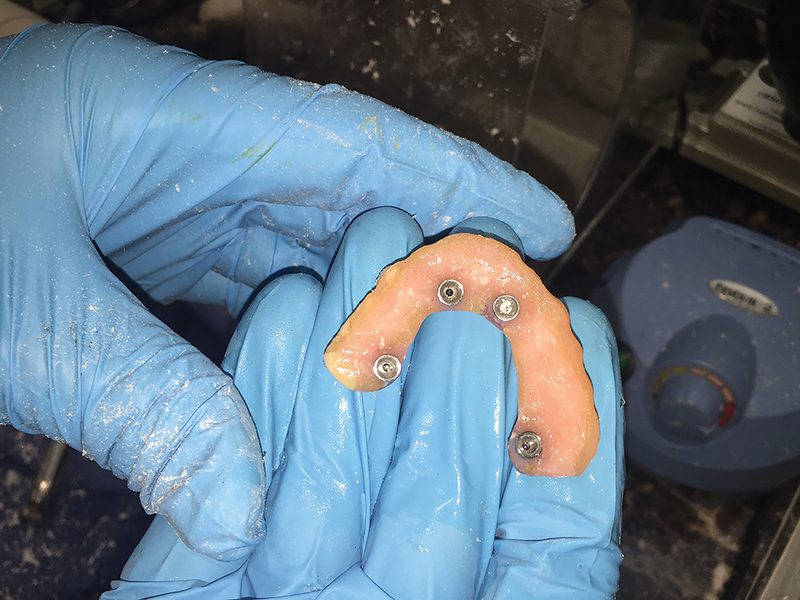 The lab will have set denture teeth on the bite blocks for the Dr. and patient to review. Make notes of any changes that need to be made and send the set-up back to the lab. If there were no changes to be made, skip to visit 5. Otherwise, continue to visit 4. Visit #5 - The lab will have sent you a framework of the bar indicated for restoration as well as a denture teeth set on the bar. Try in the bar and verify fit. Take an x-ray. 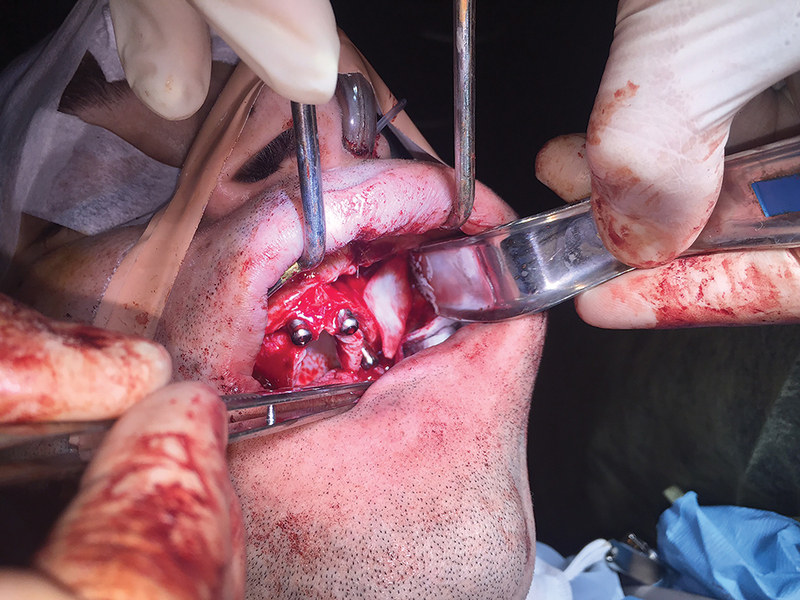 After the fit is verified, place the teeth set up over the bar in the mouth and verify the bite and esthetics with the patient. Send everything back to the lab. If no changes need to be made, the next visit will be final delivery of the prosthesis. If changes need to be made, instruct the lab to send back for another wax try in before processing. Visit #6 - We now delivery the finished prosthesis. Place the denture and hand tighten the screws. Verify with the patient that everything is correct and there are no changes that need to be made. Take an x-ray to verify fit. Once verified, place a generous amount of ortho wax in the access holes. This will ensure that the screw hex is protected. Place composite of the corresponding shade over top of the wax-filled holes. Check occlusion and equilibrate if necessary. Instruct the patient to return every six months for routine cleanings.